Nestle has launched a new campaign which utilises NFC tag technology and QR codes to provide customers with new recipe ideas in Woolworths Supermarkets. The four-week engagement activity is running across 480 Woolworths supermarkets and marks the launch of the brand’s ‘Oats and Strawberry’ campaign. Consumers tap the enabled aisle fin using their mobile device and gain immediate access to recipe ideas from Woolworths Fresh Magazine. The initiative is thanks to a partnership between Nestle, NFC communications technology provider, Tapit, and TorchMedia. In a statement, head of sales for Nestle’s cereals products in Oceania, Dean Carberry, said the Nestle brand was looking for new and innovative ways to drive engagement with shoppers. 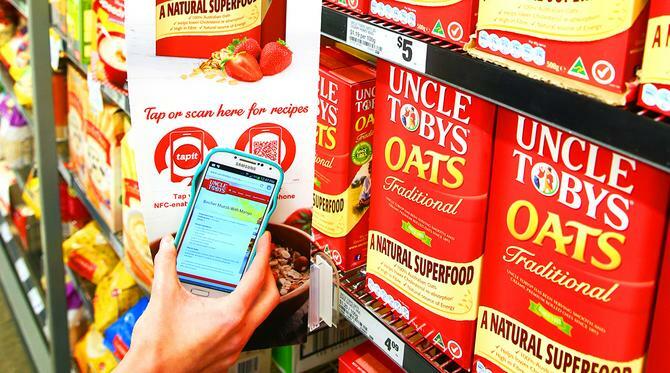 “Shelf conversion is a challenge for the Oats category, so we decided to amplify our Oats and Fresh strawberry campaign in Woolworths with a Tapit NFC enabled aisle fin,” he commented. “This will connect shoppers directly with oat and strawberry recipes, developed in partnership with Woolworths Fresh Magazine, to help drive consumption occasions. Tapit commercial director, Ben Wagner, said the new activity represented a world-first deployment for Nestle and provided consumers with useful information while helping to drive sales. “A big challenge for brands is influencing the sale in the last three feet,” he said. The analytics platform behind Tapit’s mobile technology would also allow the brand to view each physical interaction, much like an online campaign, he added. According to its website, Tapit has worked with more than 50 major organisations to deploy its contactless technology in outdoor media and retail environments including Coca-Cola, Nike, Johnson & Johnson and Vodafone. Read more Mobile marketing strategy: To app or not to app? A recent activity was with Westpac, providing bus commuters with new content using the contactless technology. In another example of the contactless technology being used for advertising, Google launched NFC-enabled billboards last year for its Play app store across Sydney, Melbourne and Brisbane domestic airports, in partnership with oOh! Media. The search giant has since rolled out billboards across thousands of bus shelters in the US utilising Tapit’s technology. TorchMedia and Tapit said work is underway on deploying further contactless communication projects with brands later this year.